The most popular kids boot on the market today, the Sorel Flurry TP Snow Boot for Kids is a staple in any little snow lover's wardrobe. Water and wind resistant and extremely durable, the Flurry TP is insulated with a removable Thermoplus felt Innerboot and has multi-directional lug soles for solid traction in any condition. Water resistant. 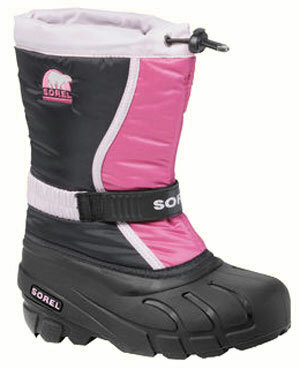 Sorel Rated -25°F. Durable water and wind resistant PU coated synthetic textile upper. Built-in gaiter with barrel lock closure system. Adjustable Gore and Velcro instep strap. Removable 6mm Thermoplus felt InnerBoot.